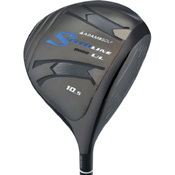 The Adams Speedline 9088 UL Driver has been developed with the latest aerodynamic technology to come from the Adams Golf testing lab. This breakthrough technology has been testing is a wind tunnel to help reduce drag and increase clubhead speed for increased distance. I have four drivers and this is my favorite. Relatively deep-faced, very forgiving and long. Tight dispersion. Pleasant sounding, looks good at address. Replaced the OEM Matrix RADIX with UST Proforce AXIVCore Black, a definite improvement. Predates adjustable heads. For what it's worth, I would leave the adjustments in the neutral position on this head! Love this driver, have hit everything from ping g10, 15, 20, k15, taylormade R7 cgb max, cleveland monster, xl, xls, srixon, w506 403, ?? bangomatic geek dot com this, failsafe, failsafe 2, failsafe 3 failsafe George suplouski?, SMT, 455, Adams 9064, Ping i15, i20, bridgestone j33, j36, launcher comp, blah blah blah. I can't even remember the 100+ drivers I have owned, but this is the longest and most forgiving. I have added a little bit of lead tape on the rear skirt on the underside off center to the heel side and this has increased the launch without affecting the piecing trajectory of this driver. its a killer, I know you will not believe me but i have had the 9064 and the 9064 DFT and this is better. The 9064 was the top driver on mygolfspy for two years, it is not even close, this is the best, best, best driver ever made. Everything, i have not tried the r11, r11s or R1, but a freien who used to smash me with his r11 by 20 yards is now glimpsing at my driver with wi fi after i have started to out drive him. just by a few yards but this is seismic as he was so much longer than me with my previous driver.